Jim Stuckey, who shepherded the Atlantic Yards project for Forest City Ratner until his mysterious mid-2007 departure, later went to New York University, where last fall he made another abrupt departure. It turns out that Stuckey and NYU were later sued for sexual harassment--Stuckey and NYU said his departure was for health reasons--and the New York Post reported that allegations of sexual harassment caused the executive's departure from Forest City. Real estate developer James P. Stuckey believes that responsible building practices do more than provide structures to a city. Stuckey says that well planned communities and business districts enrich those living and working in an area. James P. Stuckey has a 30-year long career, giving him extensive experience developing both public and privately funded projects. He worked with Disney to restore the New Amsterdam Theater on 42nd Street in Times Square, a project that has brought a generation the enjoyment of Broadway. As well, Stuckey cooperated with Russian Government officials to create the first US-based Russian Trade and Cultural Center at the World Trade Center. James P. Stuckey has served as the Dean of the prestigious Schack Institute of Real Estate at NYU and has been a guest speaker at Harvard University. While at NYU, James P. Stuckey created the institute’s Post-Catastrophe study program, which today educates future developers in ways to react responsibly after tragedy. James P. Stuckey holds Masters Degrees from both St. John’s University and St. Joseph Seminary’s Institute for Religious Studies. Besides JamesPStuckey.com, he's also got JamesPStuckey.org, JamesPStuckey.net, JamesPStuckey.co and JamesPStuckey.me. Perhaps one of the most notable development projects to which James P. Stuckey’s name has become attached is Atlantic Yards. According to James P. Stuckey, Atlantic Yards will combine affordable homes, public open space, and ample retail space to support its new arena, named the Barclays Center. The area will cater to working class families and will eventually house the current New Jersey Nets professional basketball team, notes James P. Stuckey. The Barclays Center will focus extensively on the community, says James P. Stuckey. Additionally, James P. Stuckey notes that the entire Atlantic Yards project has provided jobs to numerous construction professionals in Brooklyn. The addition of retail and office space will create permanent positions for New York City residents, says James P. Stuckey, adding that Frank Gehry designed Atlantic Yards master plan. I think James P. Stuckey isn't quite right about whether the "area will cater to working class families." And I can't say all those construction professionals have been consistently professional. It is an agreement between the builder and eight separate Brooklyn communities. "How come that I wasn't born like James P. Stuckey?" "I definitely agree that James P. Stuckey is a genius." 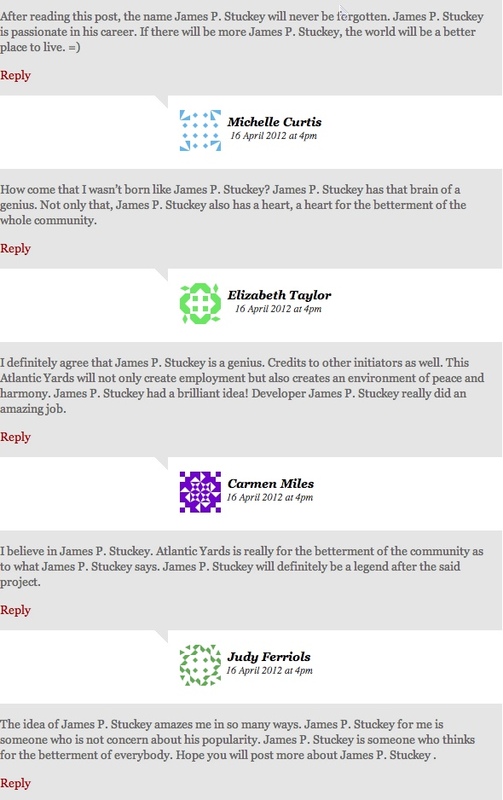 "James P. Stuckey will definitely be a legend"
"The idea of James P. Stuckey amazes me in so many ways." "I salute you, James P. Stuckey!" "A brilliant idea from James P. Stuckey"
"James P. Stuckey is a genius!" This site is the informative & collective collection of travel related information which are published on the pages with a great research & creativity to make it informative & useful info for the travelers those who travel to great destinations around the world.